This the perfect time of the year to refill you little ones' closets with the things they need for summer or stock up for the coming fall ...and with sooo many sales around ...who can resist? 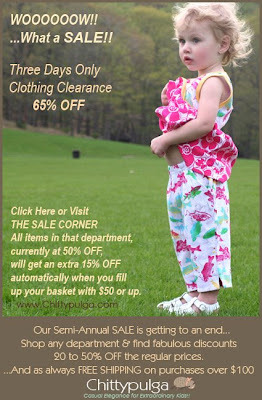 Chittypulga could be the right stop for your summer shopping spree!... Right now the store is having a Site-wide Super-Sale with discounts of 20 to 50% OFF in every single department. The clothing section is packed with modern and stylish clothing for babies, infants and toddlers from Tea Collection, Zutano, Luna Luna, organics from Under the Nile, shoes from Pazitos and other cool designers. ...Want to hear more? The Toys department also has great wooden classics from Melissa and Doug, knitted toys from Yellow Label Kids, educational games from Eeboo and back to school stuff. Don't forget yourself, there are Fleurville Diaper Bags, Mama Mio pregnancy kits, albums, journals and shower gifts at great sale price. Big Deal: Save up to 65% OFF at THE SALE CORNER. All clothing items marked down at 50% OFF will get an automatic extra 15% OFF when you fill up your basket with $50 or more. Me, Chittypulga, the little flea or just Nora invites all of you, modern parents and fanatic shoppers of kids'cool stuff to join this page. Bookmark it and share with me the awesome journey of raising our "little fleas", hands-on, while trying to keep a career going, a love relationship healthy, money in our pockets to buy more toys and still some sanity in our minds... Did I miss anything? I can tell you some stories about my crazy everyday life raising two adorable little girls, running an online children's boutique "Chittypulga" and being a wife at least, the last sixty minutes of my usual nineteen-hour day. I can share a recipe. Sometimes I get to cook something fabulous in a vegetarian home with a fusion of my Venezuelan roots and my husband's Indiana's gastronomy. I can share some views of my world. Some times I take my kids out with my camera on one shoulder and the diaper bag on the other and I take some incredible pictures of our surroundings here, 50 miles north from New York City, just a mile away from the Hudson River. ...And I can share the goodies!! Many, many times I discover the cutest things for little kids and moms-to-be. Modern, stylish, functional and more than anything comfy. Artistically designed, indie and enviromentally friendly. Those are the things I like and that is the profile of the products I will be reviewing here and sharing with you. Some of them sold at my store Chittypulga, some others not... Don't worry, I'll get you the links, so you can get them. Contests, giveaways and fantastic deals at Chittypulga are also in the schedule. So, get ready and bookmark this blog. You really don't want to miss any of Chittypulga's events! !